Orkin Pest Control is a large company that handles over 5,500 trucks. It has over 8000 employees operating in more than 400 U.S. locations. Orkin was searching for an efficient GPS solution that offers minimal maintenance, real-time accurate reporting and tamper-proof installation. The solution for Orkin was the Geotab GO GPS system. 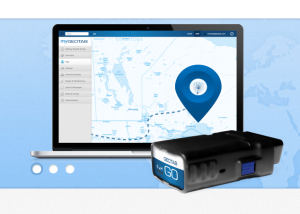 GPS to GO is an official Geotab reseller. In 1999, Orkin began to invest over 4 million dollars to install GPS devices on all its vehicles. 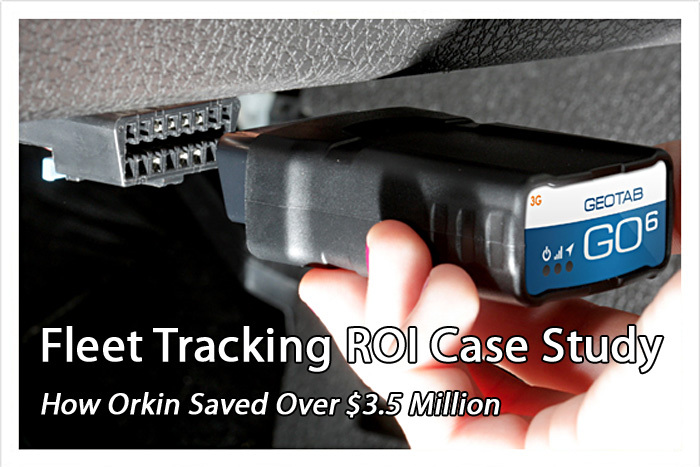 The cost may seem high, but through the years of using GPS fleet tracking, the ROI for Orkin is clear. In addition to Orkin’s driver certification program, GPS monitoring and other company-wide initiatives, Orkin experienced a significant reduction in insurance claims. Total savings: $3,5+ million dollars! Mike Gibney, Orkin’s director of claims and loss control, states that the company went from 12,000 claims in 1996 to 4,700 in 2003. This may sound strict, but putting these regulations into practice, in addition to other company-wide driver education incentives, has significantly reduced costs for Orkin, as well as enhanced the safety of its employees and the general public. While Orkin understands the “big-brother” fear expressed by some employees, the company states that the majority of its staff are comfortable with GPS. They understand that Orkin is their employer and that they’re expected to follow these rules. How Exactly Has GPS Fleet Tracking Helped Orkin? A vehicle from Orkin’s Oklahoma branch was involved in an accident. Although the other vehicle had pulled out in front of his truck, the Orkin employee was charged with the accident, because the officers investigating the accident said he was speeding. According to their calculations, he was traveling in excess of 60 mph. Upon further inspection of the GPS system, it was evident that the recorded speed at the time of the accident was 48 mph. This information was taken to the police chief, who accepted the GPS record as being more accurate than the police officers’ calculations. Read more on how GPS tracking promotes safer driving and helps with accident resolution. At another branch, a customer had a history of calling in to say she that the technician had not been to her house, even though a proper service ticket had been left at her home. In the past, the office had waived her fees, not wanting to lose her as a customer. After the GPS system was in place and the customer called to with the same claim, the branch manager pulled the GPS records and found that the technician had indeed been to her house, where he spent 31 minutes. When the customer was told about this, she admitted that the real reason she had disputed the service was because she was having financial problems and had hoped that Orkin would once again waive her fee. Orkin then worked out a payment plan with the customer. Read more on how GPS fleet tracking improves customer service. What are the benefits for Orkin in using GPS for fleet management? Accident Prevention – Enforcing that staff follow a strict no-speeding protocol. The GO GPS system also has a seat belt reminder and speed watcher system. Quality Check – Management is able to see clear evidence that employees are performing their jobs responsibly, by driving safely, not rushing through a service request or skipping services altogether. The GPS tracks the amount of time each technician spends at a customer’s residence. Maintenance – The GO GPS alerts drivers when it’s time for an oil change (after 3,000 miles), when it’s time for a transmission check (after 10,000 miles). This significantly cuts vehicle repair costs. Optimizing Routes – The GO GPS system can optimize routes and thus reduce gas costs by allowing technicians to reach clients more efficiently since trucks get dispatched within the same geographical area. The benefits of using GPS for Orkin are obvious, but these benefits are not confined to just large businesses. Even small businesses enjoy the same benefits from safer driving and more efficient customer service! Are you considering GPS tracking for your fleet? The Geotab system is the only end-to-end fleet tracking solution – from the installed-in-seconds tracking devices, to the sophisticated yet user-friendly fleet management software. Couple that with GPS to GO’s affordable pricing and no fixed or long-term contracts, and you’ll be saving money in no time. Get rolling today with GPS to GO.